Body condition scoring provides a useful and objective method of monitoring your cob’s overall health. Body condition (fatness) is also the most reliable gauge of the suitability of a horse’s diet, whether they are getting too little, just the right amount or (as most Cob owners know) a bit too much! If your horse sits between 0 and 2.5 it is vital that their diet and overall health – including worming and teeth – are looked at and adjusted. If they are non-breeding horses and between 3 and 3.5 they are in the goldilocks zone (just right!) and the aim is to keep them here. For young horses aim to keep them around 2.5 to 3 maximum so as not to put too much pressure on their joints. If your horse (non-breeding) is over 3.75 it might be best to look at ways to increase exercise and lower feed intake. Breeding horses and broodmares should have higher scores to meet the energy requirements needed for breeding and producing youngstock. 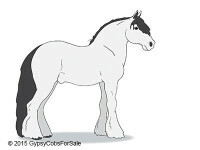 The body condition of the mare directly relates to the quality of the foal produced. Being too thin can reduce a horse’s ability to cope with cold, heat, biting insects and fungal or parasitic infestations; their risk of disease is increased. 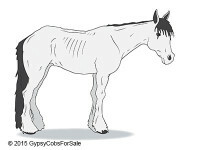 For pregnant mares, being too thin can impair the development of the foetus; for a lactating mare it may mean she does not produce enough milk for her foal. 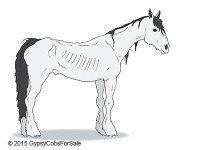 Young horses that are too thin will not have the energy to grow properly. Being too fat similarly puts them at risk through increased pressure or strain on their joints and hooves, risk of developing insulin resistance or equine metabolic syndrome, and other weight related issues. Body condition scoring is the place to start when you want to assess if the amount of feed your horse is getting is not enough, just right or too much. There are two systems for condition scoring. The first is the ‘5 point system’ also commonly called the Australian System. Back – flat and wide with ribs ‘well sprung’ (often giving a wide well rounded appearance when viewed from the front). Narrow (hollow) and slack at base. Skin sunken either side of Backbone. 3 GoodNicely arched but not cresty. No gutter along the back. Spinous processes covered but can be felt. 4 FatArched with additional crest. Ribs well covered – need firm pressure to feel. 5 Very fatVery cresty; thick crest apparent over arch. Ribs buried – cannot feel. 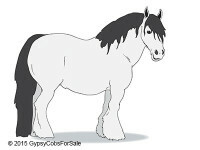 The term ‘Fatness’ is not necessarily about a horse’s weight. ‘Fatness’, which is what we assess when looking at a horse’s body condition score, is present in areas of the body where bony structures are not protected by muscle. ‘Fatness’ provides ‘padding’ between the skin and the skeleton and has a protective role. For example it can protect the spine from damage by cushioning it against bumps and knocks. 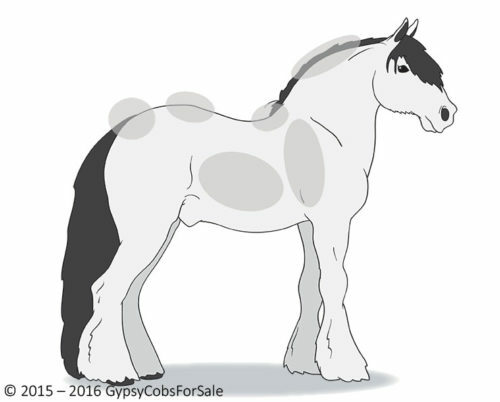 ‘Fatness’ – deposits of adipose tissue – occur when the horse is receiving enough feed to meet its daily energy requirements. The body stores the excess energy as adipose tissue. We measure the amount of ‘Fatness’ in six key areas that are not muscled so there is no confusing muscle build up with fat build up. See the last image below. How do we rate fatness? Fatness can be rated on a scale of 0 – 5 on the Australian system and varies between no fat coverage (0) and deep, bulgy coverage (5). 0 – bony structures are easily seen and felt; there is zero padding between the skin and skeleton. Areas on the neck and flanks are visibly hollow. 1 – bony structures are easily seen and felt; there is minimal padding between the skin and skeleton. Areas on the neck and flanks are visibly hollow. 2 – bony structures are visible and can be felt; there is visible evidence of padding between the skin and skeleton. Areas on the neck and flanks are somewhat hollow. 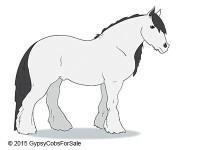 3 – bony structures cannot be seen and but can be felt; the horse is nicely fleshed out. 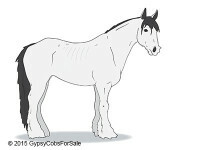 4 – bony structures cannot be seen and are difficult to feel; the horse is well rounded. 5 – bony structures cannot be seen and cannot be felt; key areas of ‘Fatness’ are bulging. How do we create a Body Condition Score? If you want to keep things simple you can compare your horse to the diagrams at the top of the page and decide which one is closest. Or you might say it is half way between two points. This is simplest for beginners. A vet or experienced horse person can help. Once you gain more experience you can start to rate the individual areas separately then combine the scores to give you an overall picture. This method is more accurate because the body stores fat at different rates in the different areas and also differently for individual horses. The scale below starts at 0 very poor, 1 poor, 2 moderate, 3 good, 4 fat and 5 very fat. How do we score fatness.